There are a lot of entertaining phone and tablet apps out there, but some of them are also just downright silly! If you’re looking for a way to pass your time with a cat-focused app, these five might just do the trick. They have certainly passed my test! Top Catz was referred to by Forbes as the “Tinder for Cats.” And if that doesn’t get your attention, I don’t know what will! The app, which is available on the Apple Store, lets people “rate” cats by swiping left or right. The project started out as a tongue-in-cheek idea, but quickly found a great deal of success among cat fans. Ever wonder what your cat is saying to you when she meows? Well, this app won’t tell you, but it’ll do a great job of pretending to let you know! 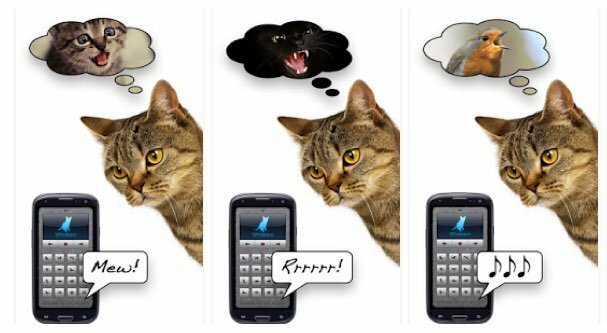 Available for Apple and Android, this app will “instantly translate” anything your cat says into English. 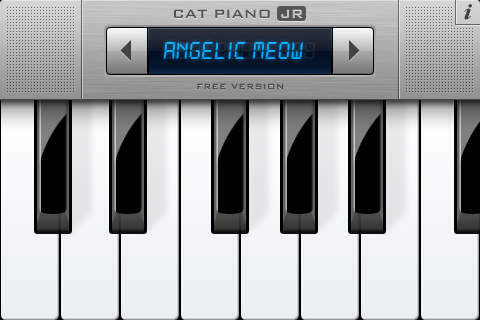 It also includes a soundboard of eight high quality cat sounds, just in case the translator wasn’t enough by itself. 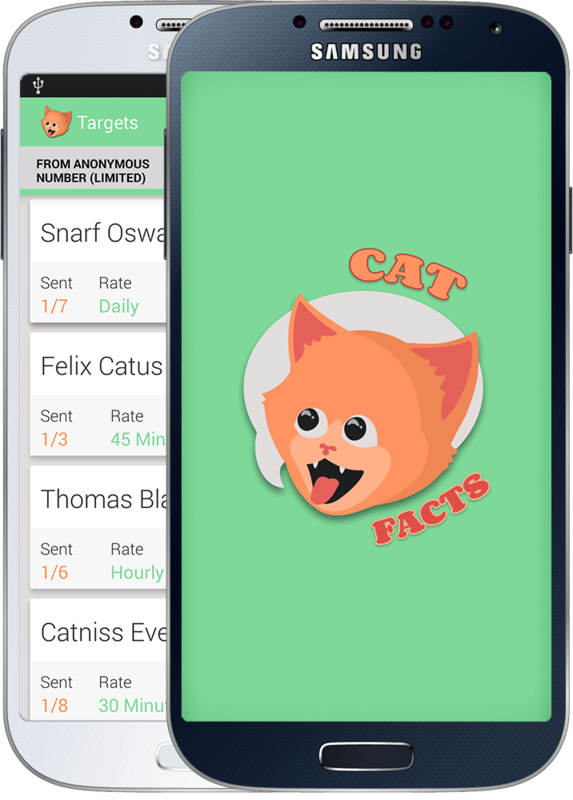 Inspired by a cat facts meme that went super viral, Cat Facts is an Android app by Vennco that lets you send five free anonymous cat facts to anyone you want, just to surprise them. 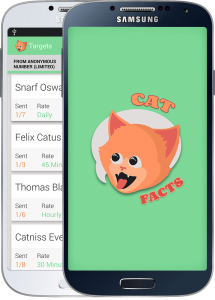 You also have the option of sending dog or sloth facts if you prefer, but these just don’t have the same ring to them as “cat facts.” The app is actually quite pretty and lets you see the entire conversation, control how frequently the facts are sent, and automate the entire process. There are numerous similar apps also available for iPhone. 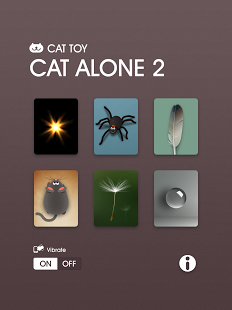 If you’re looking for an app for your cat rather than for you, then Cat Alone 2 (also called “Cat Toy”) is the way to go. This app, available for Android and Apple, features six stages of insects and other little creatures that your cat will try to catch as they run across the screen. Will this scratch up your phone or tablet? That’s not really the point! The point is that the highly-rated app will entertain your cat for hours on end. Now, if you want something a little more sophisticated, consider the Cat Snaps app, also available for Android or Apple. This app features a laser pointer and other items that shine on the screen, designed especially for your cat to paw at. But it comes with a twist – when your cat paws at the object on the screen, the app will take a selfie picture of your cat! 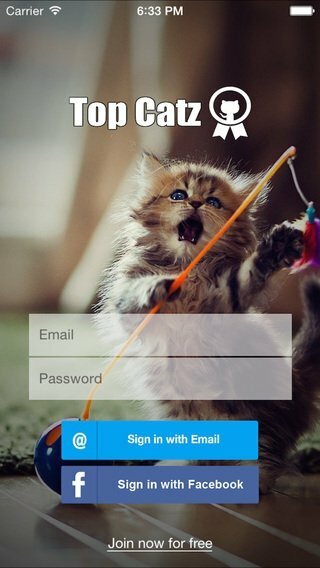 What are your favorite cat-friendly apps? Share with the rest of us, won’t you?